I'm out of town this week for work so I decided to designate it food week on the blog and catch up on all the recipes I have been wanting to post. 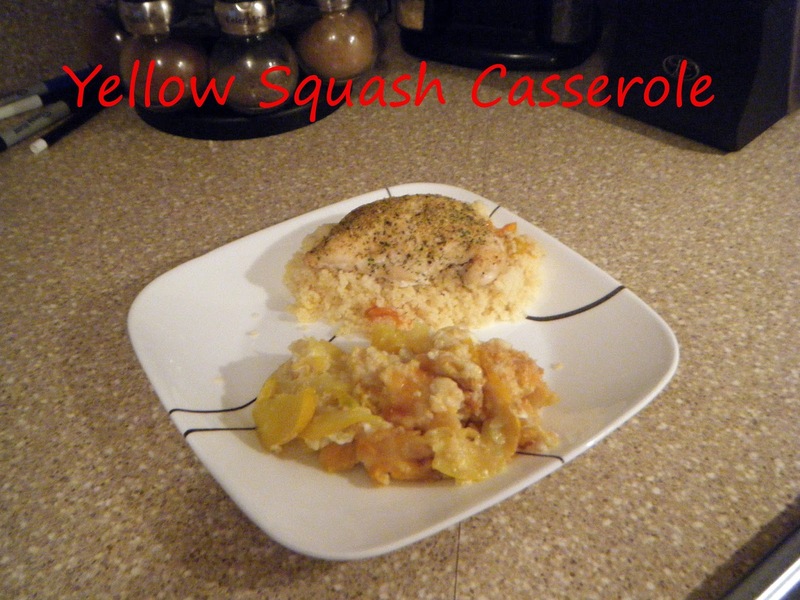 First up is yellow squash casserole. Enjoy! One of the veggies I was most looking forward to from our CSA was yellow squash. I love it and zucchini and will just roast it with a little olive oil and some salt and be good to go. When a friend of mine posted a yellow squash casserole recipe on her Facebook page, I decided to give it a try. I served it with baked chicken on top of couscous cooked with chicken broth and Sun Gold tomatoes. Place squash and onion in a large skillet over medium heat. Pour in a small amount of water. Cover, and cook until squash is tender, about 5 minutes. Drain well, and place in a large bowl. This made a huge amount and we wound up eating it as a side for several other meals during the week. I personally thought it tasted 10 times better reheated! Yum! I love squash! Thanks for sharing!